You’ve heard the phrase, you’ve seen the name, and maybe even played with your friends during a childhood sleepover at a best friend’s house. Someone always had the library of dusty old board games in the neighborhood. Before the time that board games were replaced by Candy Crush, Bejeweled, Words With Friends, or Angry Birds, you had family fun night board game events which consisted of Monopoly, Game of Life, Pictionary, Scrabble, Battleship, Jenga, RISK, Chutes and Ladders, Candy Land, Clue, Sorry, Chess, Checkers, Backgammon, Dominoes, Scattergories, Twister or any card game. Eventually, Monopoly became the top household game on the list to play. Growing up in the ever-changing digital age pinned Monopoly as the more mature board game. Its roots trace back to 1903 when it was originally called, The Landlord’s Game. According to the front pamphlet, Monopoly was presented to Parker Brothers in 1934 by Charles B. Darrow of Germantown, PA. As the game gained more popularity, Darrow couldn’t keep up with the production and so he sold the rights to Parker Brothers in 1935. We might think Monopoly was a fun time to have with friends, but there were darker undertones that came from playing such a grandiose and unforgiving game franchise. The top hat wearing Monopoly guy was the judge that harnessed all the power. With him came all the fake money bills, Community Chest, Chance, the properties, railroads, utilities, Go, green colored homes, red hotels, and the dreaded jail, luxury and income taxes. The gaming experience usually started out positive, until five hours later the last two players were nearly at each other’s throats. Trading properties and other rental features were just as much a strategy than landing on it by chance with double dice. Eventually, jail started becoming an act of defense, guarding your Automobile, Train (Delux Edition only), Battleship, Scottish Terrier, Horse & Rider, Top Hat, Bag of Money, Iron (replaced by Cat in 2013), Shoe or Boot, Wheelbarrow, Thimble, or Howitzer (Cannon) tokens. The endless amount of themed Monopoly games had different token variations. There are too many theme Monopoly games to name so I’m not even going to bother. Instead, I will list the pros and cons of what Monopoly has done to us for short and long term in the negative and positive outcomes of our future behaviors and choices. Monopoly wasn’t a game for the impatient, and whoever was the banker needed to be organized and a bit OCD. Whoever was the Virgo sign in your group of friends was probably the banker. Games could last from an hour to all night. If you and your friends are 21 and want to play this, I suggest spicing up the game with some drinks and take a shot every time a person lands on someone’s property or when they hit Chance or Community Chest. My friend used to call it Community Breast. Here we go. Monopoly was a fun way of learning mathematics, especially counting. Every time you roll the dice, every square you land on that features a property, you have to count the total number of bills you will give to the banker in order to purchase those items or the amount of spaces you’ve moved on the board. Throughout the game, you lose and earn money, so whenever you land on someone’s property you have to spend. Let’s say you take out 28 dollars, that would be a one $20, one $5, and three $1. Sometimes you have to exchange with someone so that person gives you the change. Multiplication comes from landing on utilities. If a player lands on Water Works or Electric Company and the opponent only owns that utility they have to pay the amount based on 4 times the number that appears on the dice roll. With two utilities, it’s times 10. At the beginning of the match, everyone starts out with $1500, which in today’s day and age wouldn’t get you very far. If it was realistic to today’s standards, each person should get about $30000. You get two ($500, $100, and $50), six ($20), and five ($10, $5, and $1). This is a fun and easy way for kids to begin learning addition, subtraction, and multiplication. 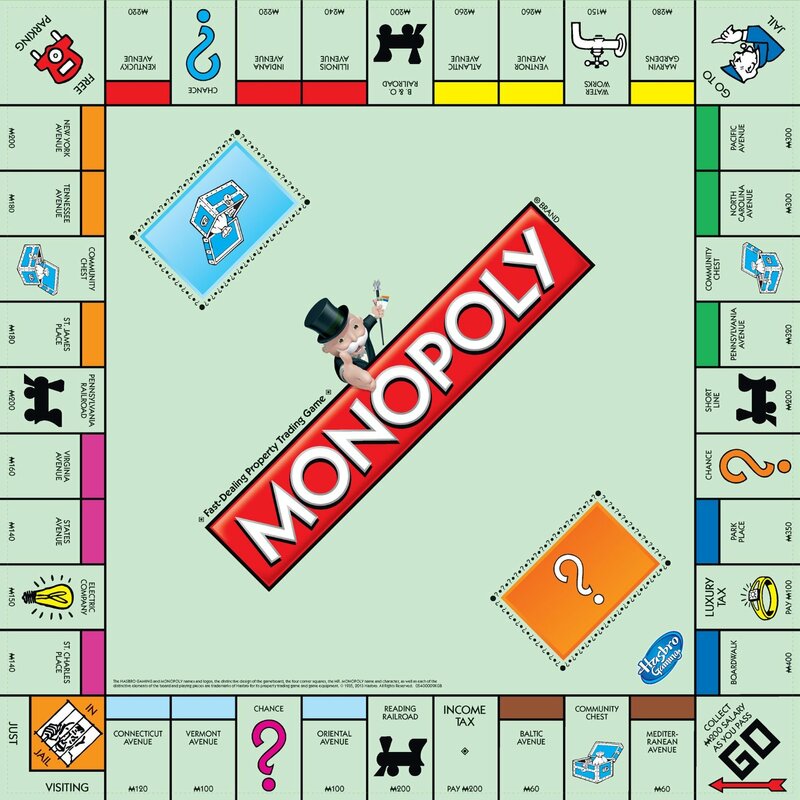 At some point in the game everyone will have a property, but no one will own a monopoly, which is having all the matching property color cards together, each monopoly either has a total of 2 or 3 title deeds. Some others might have all Railroads (Four cards total) or both utilities. The point of the game is to get the best monopoly or card sets so you can build houses and hotels on them in the chance of your opponent landing on them. Then you must try to outlast the others by bankrupting them. Sounds cruel but, we will get to that later. Trading is when the game starts to make a turning point. People playing try to make fair trades or least make it seem like they’re giving up a good deal. The one who attempts the trade is usually the one that is trying to get something out of the others and sometimes characterized by the alpha male/woman in the group of friends or family members. Without those psychological battles, trading can be a joyous experience if both parties can gain something positive out of it. The game displays the street smarts of how to negotiate with others healthfully. The roll of the dice, Chance, and Community Chest cards relies some of the game on luck as supposed to skill. Those who are beginners may lean towards luck as they don’t know the underlying skill that goes into progressing further as a major monopolizing hungry monster. Such other variations to the rules can be placing money that gets taken by Luxury tax, Income tax, or from the Chance and Community Chest cards into a large pot by Free Parking. Whoever lands on that square during their turn, wins the jackpot. The spontaneity can work for and against you in this game. Towards the end, luck can come in handy when avoiding the properties of your friends that have three to four houses or hotels stacked onto it. However, if a player doesn’t take the chance to build upon their current monopoly foundations then they’re luck will eventually run out on the board. With the right kind of people and the right attitude, Monopoly can be a fun playing experience. Like I listed at the top, some of the gaming pieces are awesome, others, not so much. The cool ones are the automobile, Scottish Terrier, Battleship, Horse & Rider, the cannon, and the train during the Deluxe Edition. Each token has a silver or gold lacquered color with textures that feel like they were forged in the fiery coals of the Industrial Revolution. You get a sense of nostalgic American History. The main purpose of buying a special themed Monopoly set is to see what tokens and deeds will be used. Some of the best tokens I’ve seen was from playing Stars Wars Monopoly Saga Edition. His character across the middle part of the board and all over the Chance and Community Chest looks like Pringles’ close cousin with his signature Walrus mustache. The Monopoly Guy just carries around a cane, maybe he has a back problem. Jim Carrey pokes fun at someone resembling, ‘The Monopoly Guy’ in Ace Ventura: When Nature Calls (1995). “Do not pass go, do not collect 200 dollars,” Ventura preaches hysterically. He kind of looks like former President Theodore Roosevelt. Maybe this character was based off the trust-busting President. That wouldn’t be the first time. Most people think going to Jail in Monopoly is hurtful to your gaming progress and an extra bump in the road. I see it as an opportunity to rest up and think of any future trades, mortgages, or building you’d like to accomplish. The jail also keeps you safe from landing on anyone else’s property. So take those three identical dice chances and start rolling. If you get a “Free Get Out of Jail” card then you won’t worry about losing 50 bucks. That $50 goes into the Free Parking spot in which you have another chance of gaining that money back and more. Possibly the best perk to playing this game is having the freedom to earn $200 every time you revolve around the board. There is a sense of relief every time I land or pass the threshold. I usually miss the Luxury Tax space by a margin. When coming around the corner, watch out for Income Tax and Reading Railroad. Taking loans out from extra properties you won’t need can help build your current monopoly higher. It can also put extra bills into your money stash in case you run into spending problems such as landing on an opponent’s square with a hotel. Although, it might seem like an eternity, the game does eventually end once one out of the last two people goes bankrupt either from not paying enough money to their opponent or by chance. There are no ties in this game. This is where the game can make a turn for the worst. According to how people play in a competitive atmosphere, some players will be nonchalant, others are sore losers, and then there are the sore winners. Sore winners in this game can get extremely greedy. If you have one person who is succeeding in the game sometimes they will buy four houses or hotels on each property within one move. I prefer to build in increments, but some people don’t think ahead and spend their fake cash willy-nilly. They begin to trash talk the other players or get overly excited when someone lands on their squares. A feeling of ecstasy overcomes them as their eyes bulge wide open to mimic a maniacal smile. The adrenaline hormone associated with gambling and jumping off an 18-foot cliff has the same effect on some people in Monopoly. The greedy player then begins to get aggressively angry if their opponents don’t land on their properties. Lastly, the greedy player will attempt to make trades that are obviously one sided. The selfish tendencies will come out as this person begins trading useless properties for entire monopolies or railroads. They try to explain that they’re making a fair trade when they’re really not. Don’t stoop to their superiority complex. It’s just a game. Remember this isn’t real money, but a simulation. In the real world, we wouldn’t want someone like you winning the lotto anyway. Who cares when it’s all fake? Some of the laid back players will have the thought that none of this matters because it’s all fake which can be a good thing. It’s bad though because those players won’t take the game as seriously and make brass decisions to nearly banishing themselves from the game board. These nonchalant people were most likely influenced into playing. They’re usually the first ones to go. If a group of people have been playing one game of Monopoly over an hour and nothing has changed, chances are everyone will start to get antsy. One person might want to gallantly move his token around the board out of sheer boredom while mimicking the movements of their piece. Avoid doing that at all costs or else you will forget where the token originally was and then everyone else will want to follow and play along. The board game will go from a structural match into a chaotic action figure warzone. Entropy will take its course, money will be flying through the air, the Chance and Community Chest cards will be thrown around the room, and all the houses and hotels will be knocked over. The banker will have their hands up in the air and then place one hand over their forehead in an embarrassing defeat. That’s when Monopoly becomes anarchy. Chance, Luxury Tax, Income Tax, Jail, etc. This board game works like a double-edged sword, it can be either your best friend or worst enemy. Everything that can be beneficial can also be your downfall. With those principles comes the Chance cards, Luxury and Income Tax spaces, as well as going to Jail. Chance is about taking risks. The name in its definition means you’re either going to get something good or something really bad. Chance also determines where you are in the game as a player. For example, if you’re at the beginning of the game where no one has yet owned a monopoly and get, “Pay tax on all houses and hotels,” then that card is useless. But if you flipped that card up later on the game, you would lose a substantial amount of bills. Sometimes Chance has you pay a random cost for beauty treatment or medical donation. Luxury and Income Tax are annoying spaces on the board that exists to piss the players off. They serve no purpose than to be the simulated government IRS out to take away your hard earned cash. With Luxury Tax, you pay $75 and with Income Tax it is either the $200 you earned from Go or 10% of your current monetary income. You’re better off going with the later option. It might be easier to give up $200, but that should only work if you have $2000 or more. Most of the time you don’t. The best way to handle these voided board spaces is by placing all of this lost money into the Free Parking zone. At least someone eventually will win some cash. Going to Jail can hurt you because when you’re behind bars you’re unable to make money from any player who lands on your properties. Those monopolies that you worked hours on creating remain useless until you get free by either paying 50 bucks, using a “Free Get Out of Jail” card or rolling the dices to get doubles in three attempts. After those three tries, you have to pay $50. You also miss out on passing Go (I don’t mean using the toilet) and earning an easy 200 dollars. Everything else on the board such as properties, Railroads, and utilities can be a pain if someone else owns them. The best strategy to have in the early parts of the game is to buy as many properties as you land on. You can always negotiate a trade later on or mortgage out properties for more money. Don’t forget to unmortgage those properties after. Like Dr. John Hammond used to constantly phrase in the movie, Jurassic Park (1993), “spare no expense”. If you grew up in an Italian or Hispanic household, chances is that at some point during a family outing or event people were screaming and yelling over each other as dramatic as the Mafia in The Godfather or Goodfellas. It always seemed like whoever quacked the loudest, won the argument. Same goes for Monopoly. All it takes is a bit impatience and for one trade to not go smoothly, eventually everyone will be at each other’s throats. It turns any game of Monopoly into a war of work. Then family members start cursing every time they land on the greedy player’s monopoly ring. Disputes could start by who gets the best token piece or who gets to move first on the board. The ratio for igniting unpleasant situations are high. Those who manage to get through an entire game of Monopoly wind up envying the winner who becomes a greedy monster. Friendships can be applied in the same way. Relationships can go into schisms if one of the partners tend to win a lot at games. Monopoly can be the match to lead a relationship over the edge due to its long and drawn out deceitful escapades. This is a stretch, but if these Monopoly disagreements go unchecked they can whirlwind into global civil wars. In a Lord of the Flies (1954) dystopian fashion, people will be fighting each other over fictional deeds such as Atlantic Avenue, Pennsylvania Avenue, Kentucky Avenue, St. James Place, Boardwalk, Park Place, but not Baltic Avenue. The trading will become a cornucopia of deeds, Railroads, utilities, and Monopoly money like the Stock Exchange. The roll of the dice will be the next atomic weapon aimed at any landmass the numbers fall upon. The winning players will be mugged and looted of their wallets. It’ll become the Russian roulette of our economy. The result will be another Great Depression and be the beginning of the end. People living homeless on the streets will be buying items with their real U.S. dollars. I’m just kidding, this last con is so farfetched it’ll never happen. Just don’t ask me about playing Monopoly online, that’s another bag of sweet and rotten apples. The lesson in playing Monopoly is to not take this game so seriously and to have fun. This isn’t real money dad. What has your Monopoly experience been like, a dream or a nightmare?